Abraham Maslow, one of the most influential psychologists of the 20th century, is perhaps best-known for developing Maslow’s hierarchy of needs—a theory of human development. The theory postulates that human motivations generally progress in a particular pattern which correlates with the fulfillment of certain needs. 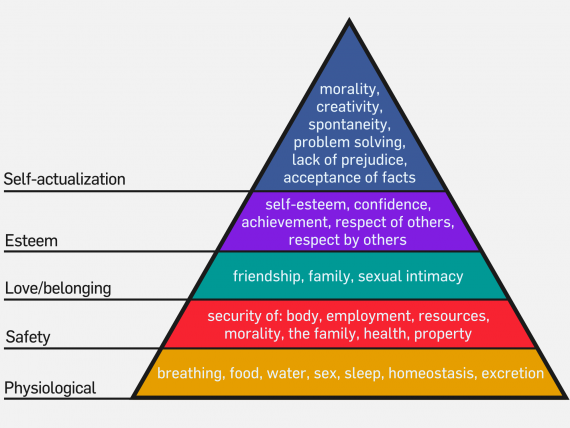 Although Maslow’s hierarchy has received some criticism, it’s a decidedly useful model of human development. This essay will focus on a problem individuals encounter once their basic needs are met and they begin to feel a need to self-actualize, or to put “a dent in the universe”: the problem of how to live an ethical life. One aspect of the need for self-actualization is a need to be good, to live a moral and ethical life. Though many are aware of Maslow’s hierarchy, fewer realize that in his later life, Maslow revised his theory to include a dimension beyond self-actualization: self-transcendence. Maslow insisted that the self finds its ultimate actualization only when it transcends itself—by working altruistically to further some higher cause and communing with that which lies beyond its boundaries through aesthetic and/or mystical experience. If you’ve ever taken this question seriously, you might have some sense of the fathomless Pandora’s Box of possibilities one discovers beneath it. You see, this question—”How can I help the world?”—is far more complicated nowadays than at any point prior. For most of human history, the answer was pretty straightforward: be kind to your neighbors and learn useful skills to benefit your tribe/community. And in a broad sense, that is still the answer. We find ourselves at a seemingly pivotal historical moment—a moment in which technology is changing rapidly, bringing with it a host of wondrous boons and fascinating new possibilities, as well as a host of serious problems, some of which may even pose an existential risk to the human species and all intelligent earthly life. Nonetheless, in the midst of this, many age-old means of helping the world yet seem like valid options—you know, being kind, being useful in your community, that sort of thing. Those options are unlikely ever to go out of style. Then there are other things—like recycling and transitioning to renewable forms of energy—that most of us now acknowledge as important ways of helping the world, though for most of human history these ideas would have been irrelevant or not understood. And then there are other things—like, say, moving all biotech and nanotech development out of Earth’s orbit and starting a second human civilization on Mars—that would yet seem like the substance of a bizarre science-fiction movie to most humans, but which may end up being indispensable to the long-term continuation of our earthly evolutionary branch. The philosopher David Wiggins makes a distinction between “non-anthropocentric” and “anthropocentric” facts. Facts of chemistry, physics, and other hard sciences are non-anthropocentric—true regardless of what kind of creatures we are. Anthropocentric facts, by contrast, are only true given that we’re humans. The moral psychologist Jonathan Haidt (whose book The Righteous Mind I thoroughly recommend) emphasizes this distinction in his work and suggests that there are moral/ethical facts, but that that they are anthropocentric facts. Interestingly, Haidt suggests that moral/ethical facts that did not exist previously can emerge at a particular stage of humanity’s development, as a result of changing moral standards. He does not suggest that moral/ethical facts are universally true at all points in history, but rather are to some extent contingent upon humanity’s collective moral/ethical development. This way of thinking about the problem makes sense to me. The question then becomes: How can we determine these anthropocentric moral/ethical facts? One answer: We might employ an ethical concept or framework—like the concept of human rights or the framework of utilitarianism—and treat its conclusions as anthropocentric facts. 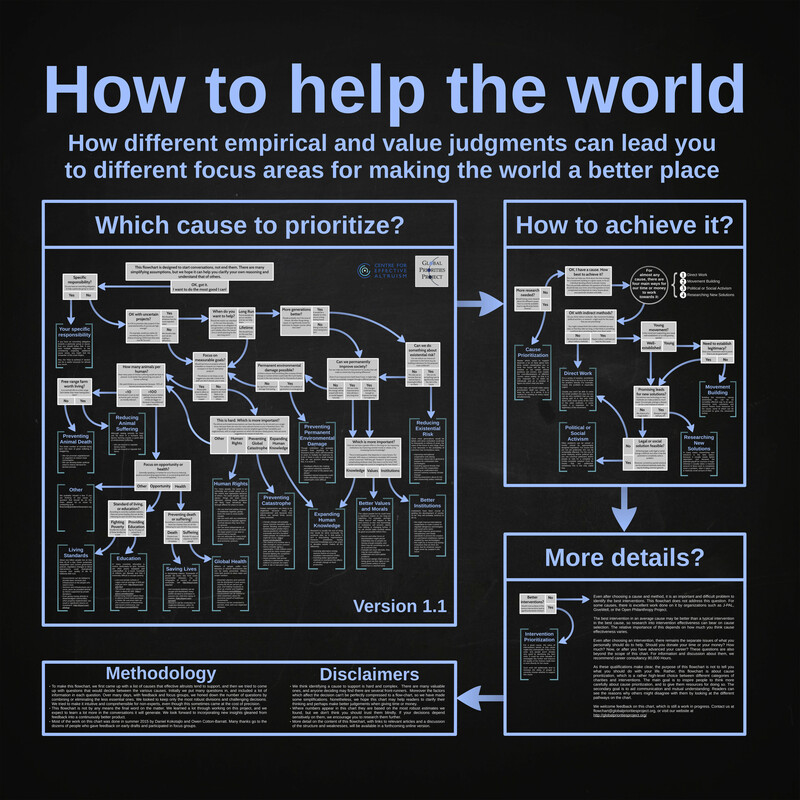 This is basically the approach of the effective altruism movement, which I’ll discuss in greater depth below. Another approach to discerning moral/ethical facts might be to ask a straightforward question: What do we all agree on? If we look at the general human consensus on what does and does not constitute moral/ethical behavior, we might find that a number of moral/ethical facts quickly become apparent. What Do We All Agree On? 1. Reduce unnecessary/excessive human and animal suffering as much as possible, in the most efficient way possible; maximize collective well-being. 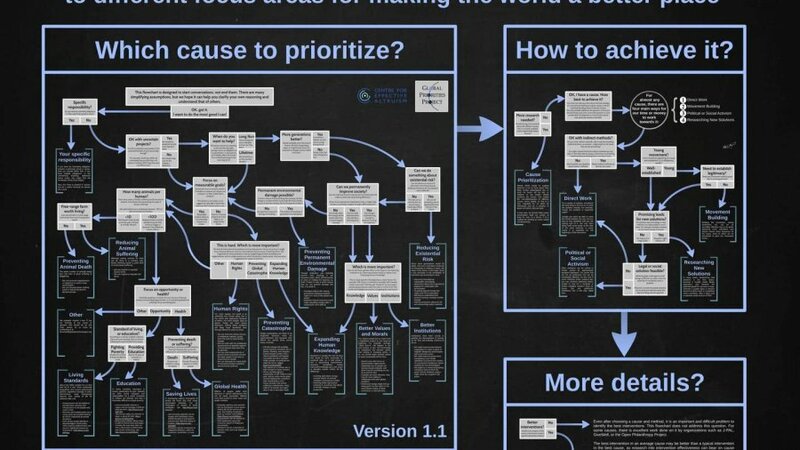 Some of the most fascinating and necessary work being done in the EA movement is in the domain of cause prioritization—i.e. determining which global issues are most pressing and determining on what basis we should prioritize one cause over another. I would be much obliged if you would take the time to read through and ponder the entire chart. Please utilize this amazing tool, and pass it on to other curious minds. Here’s to co-creating a more cooperative, harmonious, sustainable human enterprise. If you’re interested in the EA movement and want to learn more about it, I highly recommend this book. It’s a brilliant overview of the movement that will challenge your thinking, inform you, and inspire you. Also, Sam Harris interviewed Will MacAskill, one of the founders of EA, on his podcast. It’s one of the best podcast episodes I’ve ever listened to and a phenomenal introduction to EA.